Cembrano, M.; Puig, V.; Ocampo-Martinez, C.A. ; Quevedo, J.; Mirats, J.; Meseguer, J.; Ariño, R.; López, S.
Drinking water utilities in urban areas are facing new challenges in their real-time operation: limited water resources, intensive energy requirements, a growing population, a costly and ageing infrastructure, increasingly stringent regulations, and increased attention towards the environmental impact of water use. The efficient use of resources is becoming a priority for water managers and the recent advances in ICT technologies can provide solutions to this end. Real-time management in water networks may be considered as a process comprising two different levels: (i) Monitoring, which is concerned with the observation and estimation of the current state of a system and the detection/diagnosis of abnormal situations. It is achieved through sensors and communications technology, together with mathematical models; and (ii) Control, related to computing and applying the best admissible control strategies for network actuators. Optimal control seeks to optimize a given set of operational goals related to the network performance, such as efficiency in resource use, environmental impact, etc. Real-time monitoring and control techniques can significantly improve the use of water and energy resources in water networks. This paper addresses the developments of the European project EFFINET, which proposes a novel integrated water resource management system based on advanced ICT technologies of automation and telecommunications for improving the efficiency of drinking water networks in terms of water use, energy consumption, water loss minimization, and water quality guarantees by addressing the real-time monitoring and control levels. Cembrano, M. [et al.]. 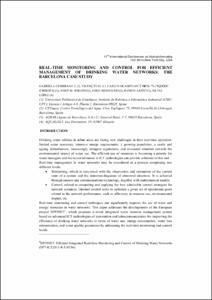 Real-time monitoring and control for efficient management of drinking water networks: Barcelona case study. A: International Conference on Hydroinformatics. "11th International Conference on Hydroinformatics". New York: 2014, p. 1-8.